Jesus came into Galilee preaching the gospel. But what gospel? You ever read it, right there in your Bible? The gospel of the kingdom of God! People say it's the gospel of Jesus Christ, and they think that's a gospel about Christ. Today, they are preaching a great deal around the world, a message about the messenger, but they are overlooking his message. You know, if you mention the word "utopia," you need to put quotes around it, because everybody thinks that is just some crackpot thing that is so foolish, it could never happen. Well, you listen to me, I bring you good news. That is going to happen, and it's absolutely certain. You know, the idea of utopia — why should we not have it? There is a cause, back of every effect. And if we have an upset world of hostility, of competition, of strife, of violence, of immorality, everything wrong today — something has caused it. And if we just eliminate that cause, and if everybody wanted to have love for his neighbor, and if everybody had love above all, first for God Almighty in obedience and reverence and worship, and we were all united in that, and everyone is trying to help everybody else, we wouldn't have any of these troubles. And if we had God's Holy Spirit, we would not be thinking carnally and selfishly and greedily, and we wouldn't be thinking competitively, and all of the things that are going on in the world today. Now the scientists of today are saying that the only hope of peace now is one worldwide nation ruling the whole world with one supreme military force, and no other armies, navies, or military forces of any kind in any other nation. But there was a newscaster who foretold this same thing before the modern scientists were ever born, or before they thought about it, and that was 1900 years ago, and that newscaster was Jesus Christ. And he came with a message, and the message that he brought was called his gospel. The message of Jesus Christ, his gospel, is not known in the world today, because he came and preached it in the years from 27 A.D. until 31 A.D., probably beginning in the fall of 27, and ending in the spring of 31. He preached to thousands upon thousands. But there were only 120, who actually believed what he said, as you'll read in the 15th verse of the first chapter of the book of Acts (Acts 1:15), after he had preached 3½ years to many thousands of people. And he was very God, in the human flesh. One of his names was Immanuel, which means "God with us." He was God, in the human flesh. And yet, only 120 believed what he said. He was preaching about the World Tomorrow. He was preaching a message of the kingdom of God. He sent his apostles out to preach the same message. Several of them were crucified. Christ was crucified for preaching that gospel. The world didn't like it. It was a gospel of world government, it was a gospel of world peace! It was a gospel of right ways of living: the way of love, the way of outgoing concern, the way of giving. It's outgoing toward God in reverence and worship and obedience, and knowing that God is the great giver, and reliance on him because he wants to do everything good for us, and has the power to do it. And also, it is love toward neighbor, and that is outflowing, not incoming. But the only trouble, and the root cause of all of our trouble in this world (and I said awhile ago, there's a cause for every effect) is living this way of get instead of the way of give. And love is the way of giving. It is outgoing, not incoming. Now as I say, the apostles went out with that same wonderful message, the world's only hope, starting in about 31 A.D. But by about 59 A.D. that message had been suppressed. Now you read in the first chapter of the book of Galatians, where the apostle Paul, writing to the churches up in Galatia. Verses 6 and 7 (Galatians 1:6-7), he said, "I marvel that you are so soon removed from him that called you into the grace of Christ unto another gospel." And yet it was not a real gospel, because he says there "which is not another", or not a real gospel. "But there be some that trouble you and would pervert the gospel," which means good news, "of Jesus Christ," the message that Christ brought. Now what was that message that Christ brought? What did he proclaim? What was his gospel? We turn back to Mark, in the first chapter of the book of Mark (Mark 1:1), is a good place to start, because the words are: "The beginning of the gospel of Jesus Christ the son of God." Now this is the very beginning of his message, the gospel of Jesus Christ. Then it goes into a few verses about John the Baptist. Now there was a prophecy in Malachi the 3rd chapter, the first verse (Malachi 3:1), that said there would be a messenger to prepare the way before Christ, and that Christ was coming as a messenger, the messenger of the covenant. He would come with a message from God, and that message is about a covenant, and of course it was the message of the New Covenant, which is going to set up the kingdom of God. Some of the churches of the Christian faith say that the church is the kingdom of God. Some others say that the kingdom of God is a nebulous something, or a nebulous nothing, I think I had better say, set up in men's hearts. Of course, when you try to define what they mean, it's just a nothing. Others have said that the kingdom of God is what they call the Millennium. Now of course, the word "millennium" is not in the Bible, but "millennium" merely means a thousand years, and the coming thousand years in which Christ will be ruling the whole Earth is mentioned in the Bible in a good many places. Then some used to say (they don't say that anymore now), that the British Empire was the kingdom of God, but of course there isn't any British Empire anymore. That has gone by the boards, and so they don't use that one anymore. People have had various ideas about what the kingdom of God is, and I think this is a pretty good time to just simply say that I have a booklet I'd like to have you write and, or telephone in on the telephone line, a free call: The Kingdom of God. Just What Do You Mean... Kingdom of God? What is the kingdom of God? Here's just a little booklet. You can read it all at one sitting, very simple, very plain. But it'll explain to you what it is, the kingdom of God. Now what was that message that Christ brought? What did he proclaim? What was his gospel? We turn back to Mark, in the first chapter of the book of Mark (Mark 1:1). It's a good place to start, because the first words are: "The beginning of the gospel of Jesus Christ, the son of God." Now this is the very beginning of his message, and of the gospel of Jesus Christ. Now the one who prepared the way before his first coming was John the Baptist. So now beginning with verse 2 (Mark 1:2), it begins to talk about the ministry of John the Baptist preparing the way before Christ. And dropping down to, say about verse 9 (Mark 1:9): "And it came to pass in those days, that Jesus came from Nazareth of Galilee, and was baptized by John," John the Baptist, "in Jordan," in the river Jordan. My, how many times I've crossed that river Jordan. "And straightway coming up out of the water," he must have been down in it to come up out of it, wouldn't you think, "he saw the heavens opened, and a spirit like a dove descending upon him, and there came a voice from heaven saying, Thou art my beloved son in whom I am well pleased." God the Father, and he is the Father of the God family, and God is not one person, God is a whole family. God is only one person in the sense of God the Father who's the father of that family. That is a family, as Christ taught, and it's part of this message of the kingdom of God, that we could be born into that family. I'm going to have more to say about that a little later. "Now after that John was put in prison..." Well, no, I skipped verse 13 (Mark 1:13-14), which is very, very important, goes just a very, very brief summary of what you will find in greater detail in the 4th chapter of the book of Matthew (Matthew 4:1-11). "And Jesus was there in the wilderness forty days, tempted of Satan, and was with the wild beasts, and the angels ministered unto him." He was tempted of Satan. That was the supreme battle for the rulership of the entire world. But Jesus Christ conquered Satan. He overcame Satan, and if we are to get into his kingdom and rule with him on his throne, we also must overcome Satan. That is a condition. We can't have the Holy Spirit of God, we can't be impregnated with the very life, immortal life of God, we can't ever enter into the kingdom of God, unless we have overcome. Now those that'll be called to salvation and conversion after the coming of Christ won't have to overcome Satan. Did you ever think about that? On the other hand, there's no promise that they're going to be ruling. But we have to qualify to overcome the one who was made king over all the Earth originally, when he was the archangel Lucifer, ruling over angels who possessed this Earth before the first human being was ever created. But they turned against the government of God. He was sent here to administer the government of God; he rebelled, and he led his angels into rebellion. And in II Peter, 4th verse in the 2nd chapter, of II Peter (II Peter 2:4), you'll read of the angels which sinned. You wouldn't think that angels would ever sin. Well, they are not holy angels, not any longer, if they ever were. They are now demons, and that Lucifer who led them and who rebelled, is now called Satan the devil. And in order that he could qualify to replace, and to sit on that throne governing the whole world, Jesus Christ had to meet, resist, reject, and overcome this Satan. And God has left him there, up to this time, and he will be here, and he is working in the people of this world right now, through the spirit in man. And he will be here until Christ comes, and one of the first things that Christ will do when he comes again to this Earth, as he is coming now soon, is going to be to remove Satan. He will be taken away from having any influence to sway, or to deceive, the world any longer. "Now after that John was put in prison," (v.14) and Jesus had qualified now, and overcome and conquered Satan, "Jesus came into Galilee, preaching the gospel." But what gospel? You ever read it, right there in your Bible? "The gospel of the kingdom of God." People say it's the gospel of Jesus Christ, and they think that's a gospel about Christ. Today, they are preaching a great deal around the world, a message about the messenger, but they are overlooking his message. And let me tell you, until I began preaching it myself, back in 1933, I (or even before that, 1931 as a matter of fact), I do not remember having heard anyone preach that gospel. I had never heard of it, and I think you had never heard of it prior to that time. 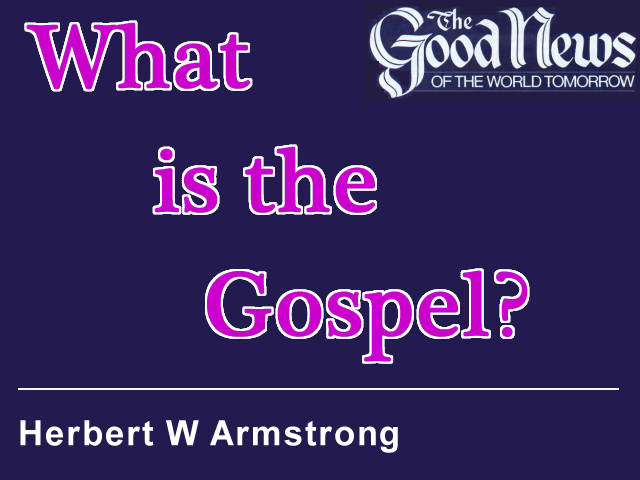 The gospel of the good news, because "gospel" means "good news" of the kingdom of God. Now the kingdom of God has not come yet, but I'm coming to that. And he said, (v15) "The time is fulfilled, and the kingdom of God is at hand." That was true because he had just conquered and overcome and rejected Satan, and had qualified to sit on the throne of the Earth, and to administer the government of God over the whole Earth. And that means one government with one... Well, if we have a military force, it'll be a supernatural government, I don't think they'll need a physical military force. But they will rule the whole Earth. "And the kingdom of God is at hand. Repent ye, and believe the gospel." Now what did he mean, the gospel of the kingdom of God? First, I ask, what did he preach? What was his gospel? It was the kingdom of God. You read here in Matthew, in chapter 4, verse 23 (Matthew 4:23): "Jesus went about all Galilee, teaching in their synagogues and preaching the gospel of the kingdom." And the kingdom he preached about was the kingdom of God, not a kingdom of man. Now I could show you how all of the parables of Jesus, related (most of them, not all of them) to the kingdom of God. The kingdom of God, he said in one place, was like leaven which will spread until it has leavened the whole lump. Or in another place, it's like a little tiny grain of mustard seed that is the smallest of all seeds, but it will grow and grow until it becomes the largest. And the kingdom of God is like that. It starts very small. Now while I'm at it, turn to the 9th chapter of Luke, for example (Luke 9:1). "Then Jesus called his disciples together, and..." verse 2 (Luke 9:2), "he sent them to preach the kingdom of God and to heal the sick." Now you'll find in the 10th chapter of Matthew the same thing. Now let's turn to the 10th chapter of Luke: "And after these things the Lord appointed other seventy also, and sent them two and two before his face, into every city and place where he himself would come. Then he said to them," it is then turning down to verse 9 (Luke 9:9), where he continued talking to them, "and heal the sick that are therein, and say unto them, The kingdom of God is come nigh unto you." I can show you that the apostles went out preaching the kingdom of God. And the apostle Paul preached the kingdom of God, and I can give you scripture after scripture that proves that. And Paul said to the Galatians, where I read to you awhile ago, that they had turned to another gospel. Then the next verse right after where I was speaking, or some few minutes ago, (Galatians 1:8-9) "but though we, or an angel from heaven, preach any other gospel unto you, then that which we have preached," and he did preach the gospel of the kingdom of God, "let him be accursed." And then he made it a double curse in the next verse; he says, "As we said before, so say I again. If any man preach any other gospel unto you, then that you have received," that was the kingdom of God, "let him be accursed." There was a curse on man or angel that would dare to preach any other gospel, and yet that gospel was not preached from around 59 or 60 A.D. until, as I say to the world, until about 1953 A.D. There's something I want you to see. You don't hear in the world called Christianity anything about Christ as a ruler, and Christ as a government man that is going to set up a government over this Earth, and yet that is what he came for. Now here it is, first in the prophecy here in Isaiah. "The government shall be on his shoulder. His name shall be called Wonderful, Counselor, the Mighty God, the Everlasting Father, the Prince of Peace," not of darkness and unhappiness and trouble and evils, but of peace. "Of the increase of his government and peace, there shall be no end, upon the throne of David," the ancient David of Israel, "and upon his kingdom." Now he's to restore the government that Adam rejected and that the former Lucifer rejected. So then later, to Mary, the mother who became the human mother of Jesus, we find the angel said to her, and sent from God, and this is in Luke the 1st chapter (Luke 1:26), "And the angel said unto her, Fear not, Mary, for thou hast found favor with God. For behold, thou shalt conceive in thy womb and bring forth a son, and shall call his name Jesus." Now listen. Listen now. "He shall be great. He shall be called the Son of the Highest," the son of God, "The Lord God shall give to him the throne of his father David, and he shall reign over the house of Jacob forever. And of his kingdom," a ruler now, "of his kingdom there shall be no end." I want you to see that Jesus Christ came, and was born to restore the government of God on this Earth! And by the way, in biblical language, in Matthew as it is translated into the English language, it's usually called the kingdom of heaven, and in Mark, Luke, and John, it's always called the kingdom of God. It reminds me of an experience I had one time. I was speaking in a two-room country schoolhouse, or in a very small town, and they could open up the partition between the two classrooms and make one sort-of auditorium out of the two, and I was saying that Jesus Christ said, "No man has ascended up to heaven." And I had mentioned how Peter preached on the day of Pentecost that David is not ascended into the heavens, and that there is no promise in the Bible of anyone ever going to heaven. Well, I didn't have much money at that time. I think I was still hitch-hiking a ride, I think I didn't even have an automobile at that time, because this goes back to about 1933. And I said, "However, I will pay five dollars to anyone who can show me any place where the Bible speaks about anyone ever going to heaven." Well, the teacher came to me after I was through; she didn't interrupt me, and it was a woman teacher. And she said, "Well, Mr. Armstrong, I'm just mercenary enough to want to collect that five dollars." "Oh, yes?" I said, "Well, can you show me where the Bible says we're going to heaven?" Yes. She turned, to I believe it was the 5th chapter of Matthew Matthew 5:6), it was in the so-called sermon on the Mount, where Jesus said, "Blessed are they which do hunger and thirst after righteousness, for they shall be filled. Blessed are the merciful, for they shall obtain mercy. Blessed are the pure in heart, they shall see God. Blessed are the peacemakers, for they shall be called the children of God. Blessed are the poor in spirit, for theirs is the kingdom of God." Then I pointed out that later it said, "Blessed are the meek, for they shall inherit the Earth." Well, she said, "There," she says, "the poor in spirit are going to go to heaven." I said, "Are you the teacher here?" She said, "Yes." "Well," I said, "Do you think you're qualified to be a teacher?" "Well," she says, "I hope so." "Well," I said, "let's see. Do you know the difference between the little word 'of' and the two-word, two-letter word, 'I am in'?" Well, she was a little bit flabbergasted, I think I could say. I said, "I've heard of a Bank of Morgan in New York. Now, is that bank inside of Morgan? Is it something that he swallowed, and it's inside of him?" "No." I says, "Does the 'of' denote 'in' or does it denote ownership? It means the Bank of Morgan is the same as Morgan's Bank." And the kingdom of heaven is the same as heaven's kingdom. It means it's owned in heaven. That's where the ownership is. That's where it belongs to heaven, and God is in heaven. It doesn't say a kingdom in heaven. I still, now I will pay a thousand dollars to anyone that can show me any place in the Bible that gives any hope or promise of anyone going to heaven. I can up it a little bit today, because God has blessed me in these last 51 years. So I said, "Do you think then those that are poor in spirit are going to go heaven, but those that are meek are going to stay on the Earth?" "Well," she said, "that would seem to be a little inconsistent, wouldn't it?" I said, "Yes, I think it would." I said, "You still want that five dollars?" And she said, "No, I guess I don't want it." And I'm not sure I could have paid it to her. I mean, I'm really not sure, if she had asked for it. Anyway, people have had various ideas about what the kingdom of God is, and I think this is a pretty good time to simply say that I have a booklet I'd like to have you write and, or telephone in on the telephone line, a free call: The Kingdom of God. Just What Do You Mean... Kingdom of God? What is the kingdom of God? Here's just a little booklet. You can read it all at one sitting, very simple, very plain. But it'll explain to you what is the kingdom of God. Now is it the Christian church? Is it the Roman Catholic Church? Is it a certain Protestant church? Is it the Jewish synagogue? Or is it something set up in men's hearts? I don't think anyone will say any longer that it is the British Empire.